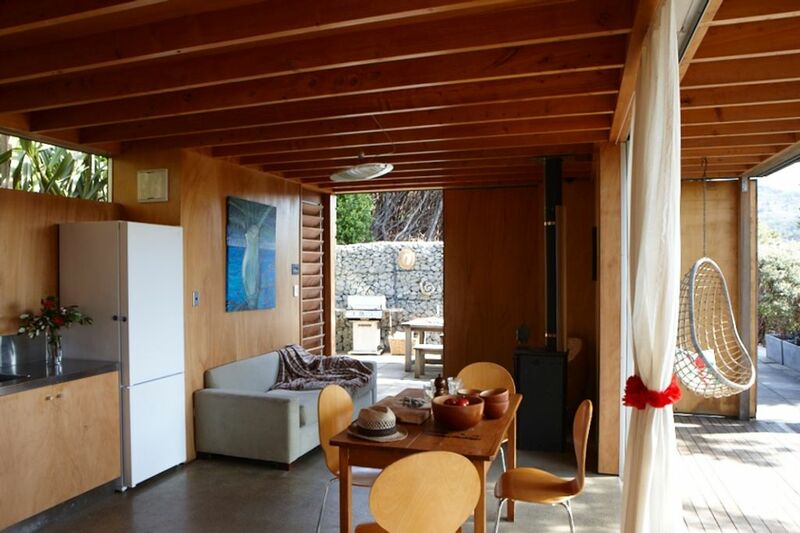 Koru bach is the idyllic holiday retreat located at the southern end of Medlands beach. It offers expansive views over the eastern coastline and Pacific ocean. Set in native bush and gardens and within easy walking distance to stunning Medlands Beach, this is a small modern eco Bach which runs from solar power. Vehicle access requires crossing of Oruawharo stream at low tide. A 4WD vehicle is recommended. Pedestrian access is via the walk bridge located next to the Medlands campground. A car park can also be found here. Medlands beach is centrally located on Great Barrier and is an easy drive to Tryphena or Claris and a great base for accessing all of the other island attractions. The nightly rate applies to two adults or couple with 2 children under 12 years. (max 4 persons) For extra adults please contact us. Beach towels are not included. We loved this Bach. Minimal and well designed! Everything we needed for a great relaxing stay. What a great Bach. Thank you for sharing your beautiful holiday house! We had a great time, wonderfully designed and an awesome location. Highly recommended. We had the BEST stay at Koru Cottage. We had the BEST stay at Koru Cottage. Exactly what we needed to unwind. The Bach is tucked away up a hill and nestled under tall whispy Manuka trees. It is so beautifully designed with everything we needed. The beach is a close 10 beautiful minute walk. The 4wd drive access across the stream was easy and the long walk up Medlands Beach is a must to de-stress. Can't wait to go back one day. We had a relaxing stay and our daughter enjoyed it too! We had a relaxing stay and our daughter enjoyed it too! We will be back, it is a great place to unwind and close to a safe and gorgeous family beach. A very nice batch in a NZ paradise. The South end of Medlands beach offers a safe tidal estuary with warm water over the summer months, suitable for small children. Great surfing along the whole length of Medlands beach and fishing from the rocks only minutes away. Safe boat launching also off the beach.